The US has to make do with a pretty simple Fiat 500 Abarth range: a 160-hp 1.4-liter turbocharged engine with either a five-speed manual or paddleshift automatic, and an optionalfabric roof. In Europe, however, things are quite a bit different: instead of the one base car, our gearhead buddies across the pond get three flavors of '595' 500 Abarth to choose from, on top of the . 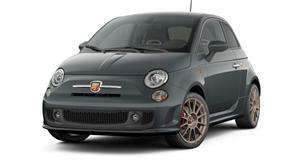 And, to make things that bit more varied, all the 595 Abarths have now been given a quick update.. Most of these changes are focused on the engines: though the raciest 595 Abarth of them all, the appropriately named '595 Competizione', still makes do with 180-hp, the standard 595 and the mid-range 595 Turismo now have 145-hp and 165-hp respectively (a boost of 5-hp over the models they replace). With such tiny increases, performance figures aren't dramatically different, though each model is still quick - the standard 595 and the Turismo can each crack the 0-60 mph sprint in under seven seconds, and the Competizione can keep the honest in a straight line. Then again, with a retail price of nearly $30,000 when converted from British pounds to US dollars, the 595 Competizione kinda needs to be that quick. Admittedly, price comparisons like that aren't really fair (according to the latest currency conversion rates, the Brits actually pay more than us for like-for-like Fiesta STs), but that doesn't stop the 595 models from being a bit more expensive than their main rivals. 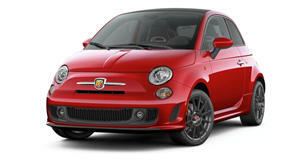 That said, you can see what the extra money gets you when you step inside: all Abarth 595 models have Alcantara trim and a flat-bottomed steering wheel, along with the pleasantries that came with the recent Fiat 500 facelift and topped off in the Competizione with Sabelt bucket seats. The Abarth 595 models are quite distinctively styled, with the sculpted bumpers and rear diffuser being quite a contrast with the curvaceous and cute proportions of the regular Fiat 500. The big changes to the 595 (at least for buyers who opt for the Turismo and Competizione models) revolve around the chassis. For instance, the Competizione gets new Koni shocks all round, with the Turismo having them fitted to the rear suspension, and the new alloy wheel designs are claimed to reduce unsprung mass and improve ventilation for the brakes, which will be especially handy for the four-piston Brembo calipers on the Competizione Abarth. Competizione owners also get the benefits of having access to the same mechanical limited slip differential from the track-focused 695 Biposto - though only if you go spec the Performance Package, and there's sadly no sign of the 695's dog-leg transmission.